“Glasgow is regenerating and evolving at a dizzying pace. Its Victorian architectural legacy is now swamped with cutting-edge style bars and world-class venues to tickle your taste buds. 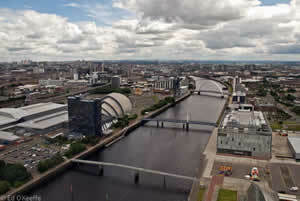 The city is going through a long-term transformation, evident along the revitalised River Clyde”. So why wait? Glasgow is waiting you to come, stay and enjoy what’s on offer, from the cheap to the lavish, you will find what you’re looking for in Glasgow. Staying at The Georgian House Hotel, you will be right in the middle of Glasgow's West End. Positioned perfectly for you to take a short walk from the premises to enjoy some of the local amenities, or use Glasgow’s excellent transport system to travel to any of the excellent activities. We are a small hotel/guest house that seeks to give our clients the most pleasant stay and provide the best possible service, if you have any special requirements or any questions at all please do not hesitate to get in touch.